Yet another new study is shedding light on being addicted to digital devices — whether it’s your smartphone, tablet, laptop or computer. And like other completed or ongoing research, it concludes that too much “screen time” can affect the physical and mental health of users. The latest report, published in the journal JAMA Pediatrics this week, focuses on toddlers. It found a direct association between screen time at ages 2 and 3 and potential issues with development at 3 and 5. Development includes progress in language, communication, motor skills and “socio-emotional health,” researchers said. By the time they start school, a quarter of children show some deficiency or delay in these development skills, including communicating, the report states. “Thus, many children are beginning school inadequately prepared for learning and academic success,” the study says. The report is only the latest to focus on health issues tied to obsessive screen time, especially among young people. However, adults of all ages can also suffer the health consequences of the mobile-digital age, other studies have found. Too much sitting, a sedentary lifestyle, too much unhealthy snacking, poor sleeping habits and less social person-to-person interactions are some of the byproducts of too much screen time, say Baptist Health South Florida experts. A 60 Minutes report on CBS last month revealed that a $300 million study is following 11,000 children at 21 testing sites across the country to evaluate how screen time is affecting their brain development and mental health. The study involves teenagers undergoing MRI machine scans to detect brain activity as a screen shows them images from their Instagram accounts. In the first phase involving 4,500 participants, researchers noted significant changes in children’s brain development if they spend more than seven hours of screen time a day. “There’s a lot of data out there and there are more and more studies being done because this is such an important topic,” says said Sergio Jaramillo, M.D., neurologist with Baptist Health Neuroscience Center..
Dr. Jaramillo points out that the problem with this type of data is that children’s brains are “being rewired constantly based on their experience and what they’re exposed to” and it’s challenging for researchers to come up with data that shows a cause-and-effect between screen time and developmental issues. But there has been progress, he adds. Too much time on digital devices “really affects so many aspects of our health,” stresses Amy Exum, psychotherapist for Care and Counseling Services at Baptist Health South Florida. The American Academy of Pediatrics (AAP) has set the following guidelines for “daily screen time” for kids on electronic devices. 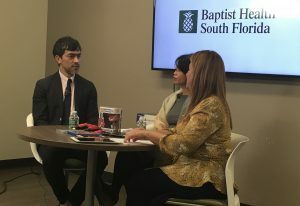 Watch Now: Sergio Jaramillo, M.D., neurologist with Baptist Health Neuroscience Center, and Amy Exum, psychotherapist at Baptist Health, discuss “Screen Time and Video Games: Impact on Brain and Mental Health” on Facebook Live.